Collaboration between corporates and startups in Austria is in the forefront, as a recent survey of the consulting and investment company Venionaire Capital among the largest Austrian companies revealed. More than half of all surveyed companies have already worked together with startups. Especially innovation competitions, such as the annual “Innovation to Company” startup challenges developed in cooperation with the Vienna Chamber of Commerce, are particularly popular. With this great interest in startups, Austria follows an international trend. As a study by the business school INSEAD and “500 startups” from the year 2016 shows, more than two-thirds of the international top 100 companies deal with this topic. Global players, however, are not only looking to work but also invest in startups. Austrian companies were still hesitant in the past regarding early stage investments, but changes are emerging. A good proportion of the surveyed companies would like to invest in startups in selected cases, which is, for example, possible through a partnership with the European Super Angels Club. Companies are also thinking about their own accelerators and corporate venture funds: “Corporates do not shy away with their accelerator and innovation hub programs from working with partners from complementary industries, as it is the case with Talent Garden in Vienna. Regarding corporate venture funds, openness depends very much on the extent of the strategic orientation of the corporate”, explains Berthold Baurek-Karlic, founder and CEO of Venionaire Capital. 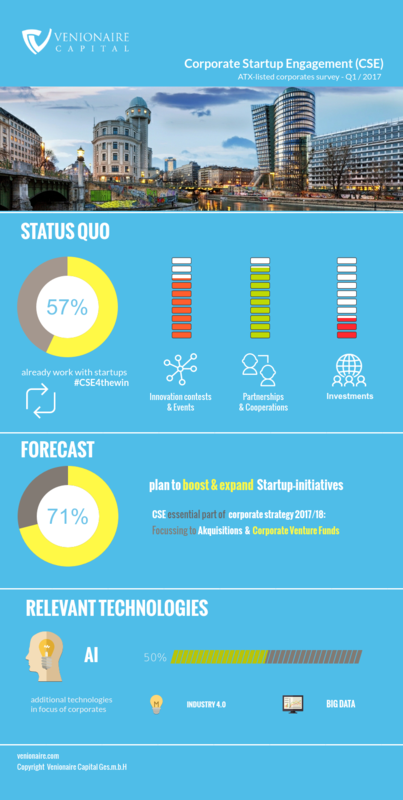 Our survey shows, that all companies, which have already worked with startups, want to intensify their startup activities. Companies with no startup engagement yet, see it as a potential part of their 2017 digitization campaign. The motivation for working with startups coincides with the global study from INSEAD and 500 start-ups: Established companies expect from a corporate startup engagement (1) more innovative ideas, (2) fewer innovation costs, (3) the possibility to test new products, and (4) mitigate the threats of new digital business models. Austrian corporates show a high interest in Artificial Intelligence as well as in big data and Industry 4.0 ( digitization of machines, infrastructure and buildings).